The NP20 that came with my camera worked fine for 6 months. It didn't really get all that much use though. Last time I used it was in Jan.'09 on a ski trip. I charged the battery fully the day before I left, 1/4/09, and then only took 12 pic in 4 days. Since I didn't have a use for it again, I left the battery in the camera as I've always done. When I went to turn it on this time, only a little over a month later: 2/18/09, it was totally dead! I thought this was impossible. But I put it on the charger and left it over night. When I went to get the camera I noticed the charge light was red and blinking, not green, as it should have been. So, I took the camera off the charger and then put it back on again, thinking I didn't make the connection properly. The red light began blinking with in a couple of seconds again. I did this 2 more times, but always got the same result. So I called Casio and got the scoop. Poor quality batteries. They are sending me a new one. Then I got on the web to find out what's with this issue and found out this: A blinking RED light means the battery is NOT charging. Don't throw it away and don't send the battery anywhere. Just call Casio and they will send you a replacement. 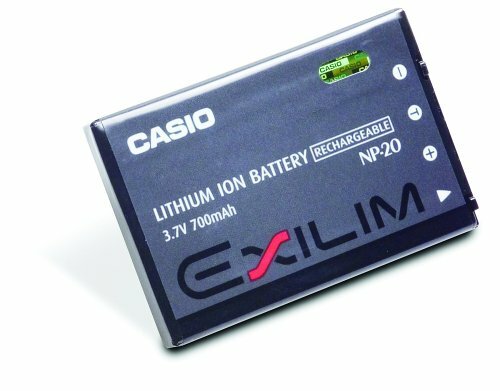 The NP20 battery is just garbage, and Casio knows this, which is why they will send you a FREE replacement battery, as long as your camera is still under warranty. However, Casio doesn't have any other type or brand of battery to replace it with because this camera was designed to work only with the NP20 battery style. They can only send you another NP20; but that doesn't mean other brands or 'generic" lithium batteries are any better or worse. Some people are doing fine with off-brand ones while others complain they don't pop-out like the NP20 is supposed to. BTW, my NP20 battery doesn't always pop-out either. this was a total waste of time. I bought the battery to replace one which had was dead and the new one was just as dead as the old one,. I was ripped off because the battery sent was dead. I checked the charge with a reading monitor and after it was charged it was dead as a door knob. Be careful about someone offering you a battery because probably the only reason they are selling it is because it was dead. One star rating only because I could not do zero stars.